Zimmern o.R., July 16, 2013. 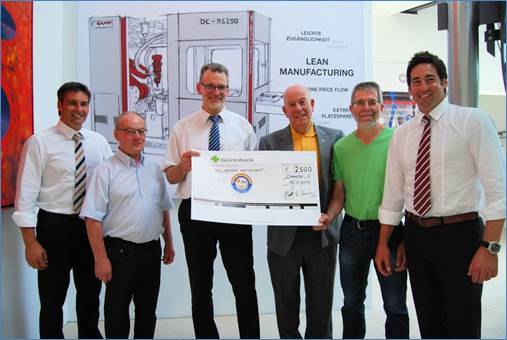 RAMPF Dosiertechnik, a leading manufacturer of low-pressure mixing and dispensing systems, has donated 2,500 euros to Verein zur Förderung der Strassenkinder in Bolivien e.V., a German association supporting street children in Bolivia. The money will benefit the Fundacion Arco Iris headed by Father Josef Neuenhofer, formerly a priest in Rottweil and Dunningen, which helps children and young people in La Paz. “That’s really impressive. We don’t have anything like it back home,” says Father Josef, who is amazed at the state-of-the-art premises of RAMPF Dosiertechnik in Zimmern o.R. Referring to La Paz as home shows how much the 75-year-old identifies with his work in Bolivia’s capital. Father Josef has been committed to unwanted children there for over 20 years. These are children and young people who have lost their parents or been thrown out by them and have been living on the streets ever since. Every two years, Father Josef visits Germany to report on the work of the Fundacion Arco Iris (“Rainbow Foundation”) and to collect donations – on this occasion, including the one from RAMPF Dosiertechnik in Zimmern o.R. “These young people have no identity. They don’t know their surname or when they were born,” says Father Josef, describing the street children’s circumstances. He explains that the widespread illiteracy among these children and their hopeless economic situation mean they have very poor prospects for the future. “How can they get a job when they can’t read or write? And how can they open a bank account if they don’t know their date of birth or surname?” he asks, adding that in most cases this lack of prospects leads to a life of crime. Although this starts on a small scale, the value of the items the children steal quickly increases along with their needs. Drug abuse is also a widespread problem. “These attempts to escape their predicament mostly result in the children ending up in prison,” Father Josef states. When he was sent from the diocese of Rottenburg/Stuttgart to minister to the street children of La Paz, Father José, as he is called in Bolivia, set up the Fundacion Arco Iris in 1993. This foundation now employs some 200 local teachers, childcare workers, psychologists, skilled craftspeople, cooks, doctors, and unskilled workers. There are various projects aiming to provide the children with the necessary means to escape the vicious circle of poverty and crime, including a mobile school, a bakery with several stores, a carpentry shop, a laundry, and a plant nursery. The foundation also runs the Arco Iris Hospital, three ambulances operating in the slums, several homes for children and young people, and a children’s bank. So there are plenty of projects worth supporting. This view was shared by the employees of RAMPF Dosiertechnik when they decided to donate the proceeds of their tombola to Father Josef’s foundation. “As is the case every year, we gave very careful consideration to who should benefit from the money. The foundation’s commitment to street children in La Paz is truly impressive and we are delighted that we can support its work with our donation,” says the Chairman of RAMPF Dosiertechnik’s Works Council Manfred Riedlinger, speaking on behalf of the staff. “In the past, we have mostly donated to local institutions, including the children’s aftercare clinic in Tannheim, the DKMS – the German Bone Marrow Donor Center – and the hospice on Dreifaltigkeitsberg in Spaichingen. This year, however, we have opted for an international donation, although of course there is a strong regional connection to Rottweil and Dunningen,” he explains. Verein zur Förderung der Strassenkinder in Bolivien e.V. was founded in 1997 and is based in Rottweil. The donations it collects ensure the valuable work Arco Iris does in La Paz can continue. The proceeds from the staff tombola were doubled by the company as is the tradition. “I can only take my hat off to you. I very much admire your commitment and determination,” says Bernd Faller, Managing Director of RAMPF Dosiertechnik, to Father Josef. Faller, Riedlinger and RAMPF Holding CEOs Michael and Matthias Rampf were in favor of the donation being used for projects in the areas of health and vocational training. “We are aware of the great importance of vocational training for young people and we hope this donation will help the children in La Paz learn a trade and thus give them prospects for the future,” says Michael Rampf. Father Josef thanked the employees of RAMPF Dosiertechnik and the management team, and stressed that the money would do a lot to give the anonymous children and young people in La Paz an identity.